We just released new crop of Taiping Houkui 2017. 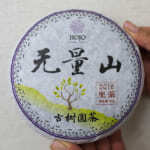 Since the quality was outstanding this year, we bought two types; one of it is the special tribute Taiping Houkui. 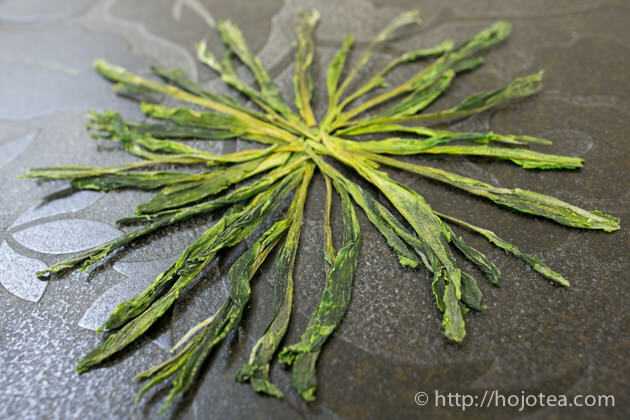 Taiping Houkui is the signature green tea represented Anhui province. The appearance of Taiping Houkui is very distinctive. The tea leaf is long and flat. 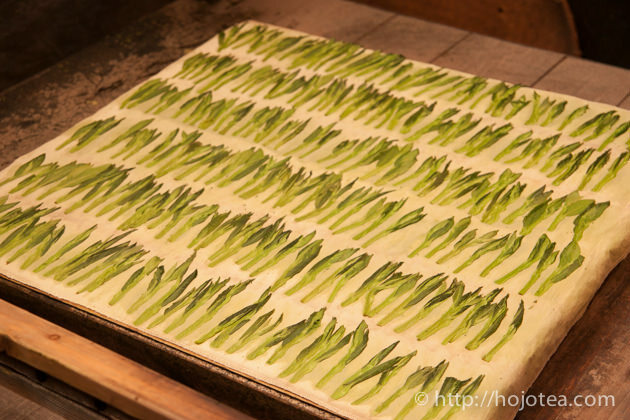 At first glance it is like pressed-flower. 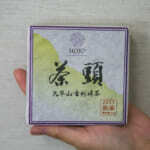 Because of its unique appearance, a number of people tend to think that this tea is made of a huge tea cultivar. 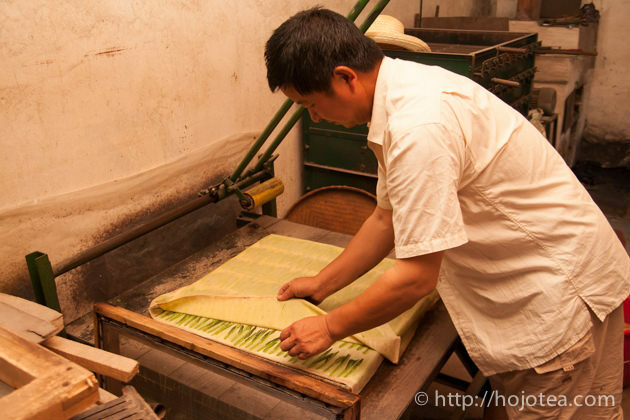 However, the fresh tea used for making Taiping Houkui is the same as other types of tea. 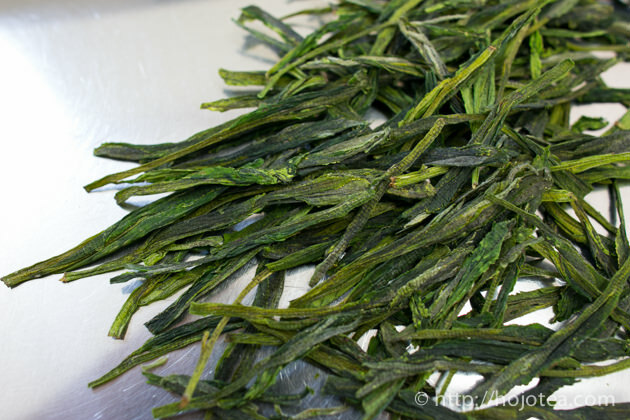 The distinctive appearance of Taiping Houkui is because of the timing of tea plucking is slightly later, and it undergone special rolling process. Although I called it rolling, it is not really rolled with rotary motion. 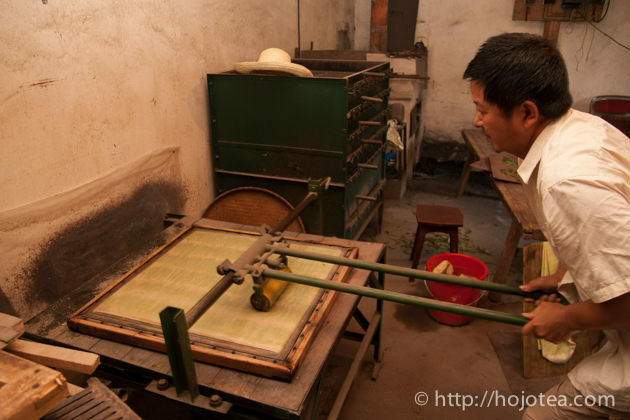 Every single twig of fresh tea leaf is manually arranged carefully and pressed with a roller, and then it is baked in the oven for drying. The flat and long shape is formed thanks to these processes. 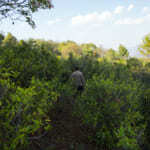 Generally, a number of Chinese green teas are made of younger tea leaves. 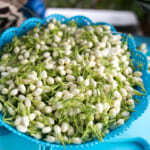 It is to emphasize the mellowness in taste and creamy mouth-feel. 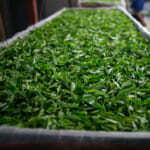 Nevertheless, I personally prefer the tea which processed from more matured leaf. 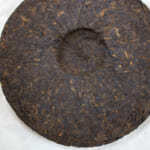 The matured tea leaf gives less umami but more floral flavor and thick in taste with more complex drinking sensation. 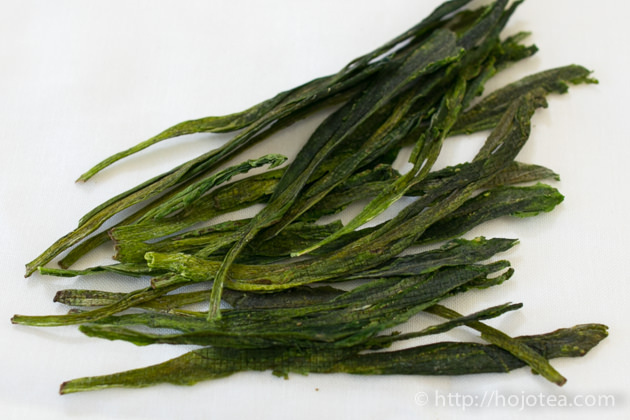 In a way, I love the plucking standard of Taiping Houkui. 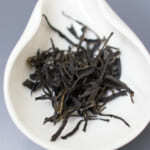 As this tea is made of the matured leaf, it gives very clear and floral scent that reminds me of orchid flowers. It gives flavor reminiscent Taiwanese high mountain oolong too. It is a very pleasant tea with comfortable finishing; I do not mind drinking it for all days long. 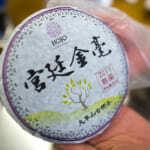 I guess those who like Taiwanese oolong would enjoy this tea too. We bought two types of quality, the standard and the special tribute quality. The standard Taiping Houkui gives more up-lifting fresh leafy note with a hint of orchid floral flavor. The special tribute is collected from the garden that is located at higher altitude. The special tribute gives much softer taste and more long-lasting flavor than the standard grade, finished with a clear drinking sensation. In my impression, I felt that the standard grade is pretty good. Though you may need to consider the special tribute only if you are highly committed for the high quality. 2. 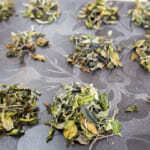 Pour in the tealeaf, pour in the just-boiled hot water and infuse shorter than usual (preferably within 30 seconds). This brewing method will effectively extract poly phenol and it gives more refreshing floral scent. 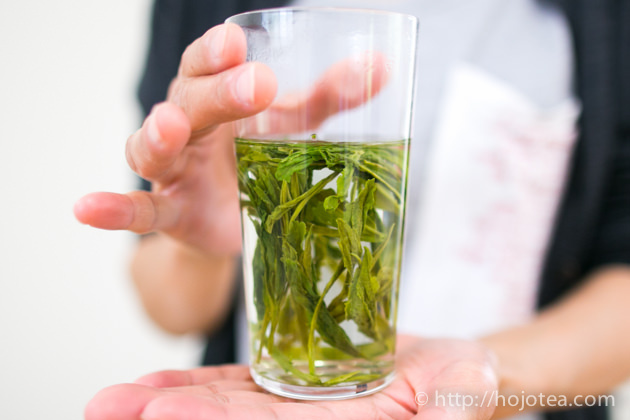 In China, it is very popular to brew Taiping Houkui in a long glass. 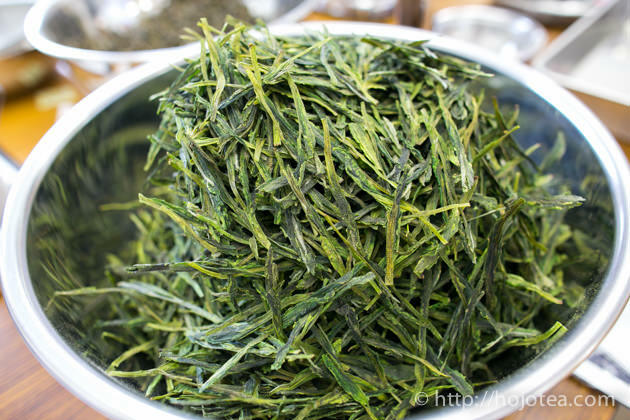 You can enjoy the beautiful leaf as well as the up-lifting floral flavor. 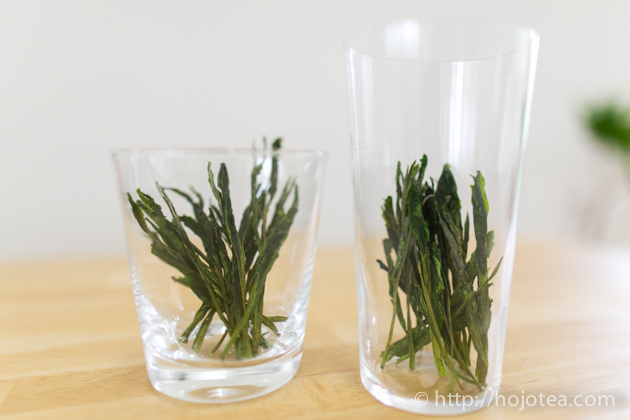 For brewing tea in a glass, you can choose any type of glass. However, please avoid colored glass as it affects the taste. 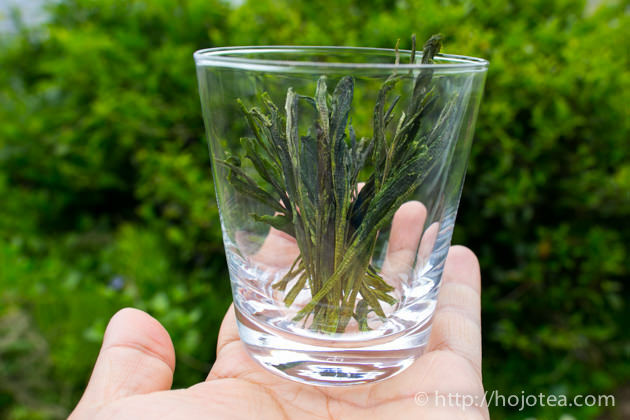 Taiping Houkui is suitable for cold water brewing too. For cold water brewing, please use the boiled water and let it cool down. Water contains calcium bi-carbonate that will be converted into calcium carbonate when it is boiled. Normally, I use 5g of tea leaf in 1 Liter of water and leave it in a fridge for a few hours. It is very refreshing and pleasant to drink especially in warm weather.